What started in 1929 as a one-man operation, has grown into one of the planet’s biggest manufacturers of welding equipment – yes, it is “The power of Blue” – Miller welders. The Best Miller TIG welders are created through innovation and in compliance with the ISO 9001:2000 standard. The high standards of workmanship used at the plant through the dedicated and professional team at Miller have the effect that you are sure to purchase some of the best equipment on the marketplace. It will be impossible to review all their high-quality products, so we will review the Best Miller TIG welder available on the market today. TIG welders as compared to MIG welders are more complicated to use yet they are also suitable for more complicated welding projects. But this doesn’t have to be the case, right? This is the reason why the Miller company decided to create the Miller Diversion 180 TIG Welder 907627. This welding equipment is designed to give a more pleasurable (not to mention a lot easier) experience to welders, both beginners and veterans alike. As expected from Miller, this TIG welder has all-around features that allow you to use it anywhere. You can connect it to both an AC or DC power source without the need to use any special adapters. Also, it can operate on both 115 or 230 voltage input. The main feature of this equipment, though, as what we have earlier mentioned is its usability. All you need to do is to follow the interface. Turn the power on, select the specs of the material you are using such as its thickness, and you can already start welding. Finally, the size and weight of this TIG welder is ideal and portable for both home and outside use. This means that you can easily transport it to any location due to its fifty-pound weight and reliable side handles. Read our detailed Miller Diversion 180 Review. TIG Welder, Dynasty 200 SD is one of the most in-demand tig welders in the market today produced by the reputable company Miller. This Dynasty TIG welder is known for its safety and all-around features. Its cable connectors are of international range hence, you are sure to be able to use this tool anywhere. It also allows an AC or DC source of power, so there is no need to use any special adapter. It just plugs and plays. Not only that, this welder is pretty light weight as well compared to the other welding equipment available in the market with the same features and it comes with a durable handle that will allow you to carry it with you wherever you want to bring it. The total size is fifty-four pounds. Given these features, it has been listed and applauded in different reviews as one of the most portable TIG welders around. Feel free to use this equipment, and its torch (by the way, it’s air-cooled! ), for personal and professional use. Finally, we applaud that it follows the different safety compliance required for welding equipment. In this way, the user will be rest assured that this tig welding equipment would function safely while performing high-quality projects. TIG welding is a way of manually welding materials using a special filler and is known to produce the best welding outcomes ever. These projects could include furniture, pipe fixtures, tubes, and other types of welding works using a variety of materials. Read our detailed Miller Dynasty 200 review. These welding machines can be applied for fabrication, aluminum, stainless parts, automotive and sport aviation. Diversion welders are easy to handle, posses digital operation control panel and has all in one package at an affordable rate. The Dynasty series has advanced version to be applied to a vast variety of metals. These models come with AC/DC controls that provides high quality welds and an optimum control over the arc and puddle formation. The basic application could be fabrications, repairing or maintenance. Maxstar welders come in compact mobile designs. These have an increased ability to provide high quality welds through arc control. The most common applications would include manufacturing, maintenance and repairing, construction and fabrication. These welders are commonly applied to industrial purposes or shops. These are also considered to be very easy operate. Amperage range plays an important role in deciding on the right TIG machine. One that provides the widest range possible at the best possible cost is usually a good starting point. A range from 5 – 230 Amps (115V – 230V) gives you the scope to work on a variety of thin metals. Arc Stability below 10 Amps plays an important role in arc control, easier starting and a high-quality fill at the end of the weld. Arc stability is as important during welding as it is at start-up. Machines with an AC/DC power source capability as AC power is ideal for metals like aluminum while DC power is ideal for harder materials like steel. The machine should be easy to use with built-in mechanisms making welding a walk in the park. Settings like increasing or decreasing AC power is vital when working with certain materials while a foot pedal is nearly a non-negotiable. Ensure that the TIG welder stands up to the right standards and that features add to the machine’s lifespan. Examples include a cooling fan that should ideally provide cooling only when needed. 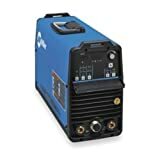 In choosing the best Miller TIG welder, you are assured that your machine is durable, create a high-quality weld and is built to ISO standards. Coupled with an after-sales team that is professional and provides customer service beyond expectation, you are sure to invest in a high-quality machine.